If you have a child in primary school, on at least one occasion you will have had a child return home from school with a ‘friends’ issue. This book follows on the success of The Great Big Book of Family, and The Great Big Book of Feelings, both of which aim to show that there’s no right way to be a family, and no ‘right’ way to feel. 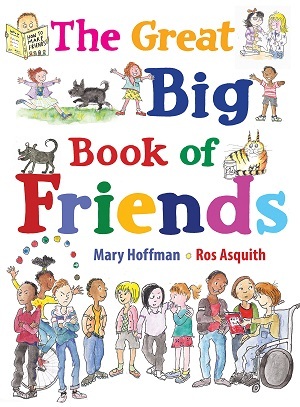 The Great Big Book of Friends shows the reader that there is a multitude of ways in which you can be a friend, and have friends, but that the number of them isn’t important. It’s always hard for a child to understand how some people act, why friends fall out, when they behave strangely, or are jealous. It can be difficult to see previous friends seek new friends, old friendships die out, and friendship groups switch and change – as they frequently do at this age. Hoffman very simply explains some of this behaviour, and gives a reassuring guide to what’s okay. From defining who might be a friend, to expressing that one needs to be a bit brave in seeking friendship, the book is overwhelmingly encouraging and comforting. Some people find it easier to make friends, some don’t have best friends, and Hoffman explores how friendship changes over the ages from being something about sharing playdough perhaps to sharing opinions. The book covers a range of psychographics, exploring what happens when friends don’t share our interests or think like us – very topical indeed. No one wants to be surrounded by an echo chamber all the time. The cartoon-like illustrations all assist Hoffman in making her points, as well as showing the reader a wide range of people – both in demographics and diversity. The colours are bright and inviting; and there’s a humorous cat on each page, also struggling with the concept of friendship, which lightens the subject considerably. Each page is active – there are speech bubbles and thought bubbles, and a range of borders from stick figures holding hands to emotions shown when friends are ‘lost’. There’s nothing ground-breaking here of course; some of this will seem like truism or platitude, but the concepts and ideas are expressed excellently, and it’s an informative back-up tool for exploring an upsetting or new situation. In the end, this aims to show what is normal and acceptable – and it turns out that everything is – even solitude. The Great Big Book of Friends will be a core title in helping to support a child’s well being and emotional and social development, but it’s also fun. A positive, heartening book, which may serve as a good reminder to those adults sharing the book with their child – the best friendships develop from the smallest kindnesses. You can buy a copy for a friend here.